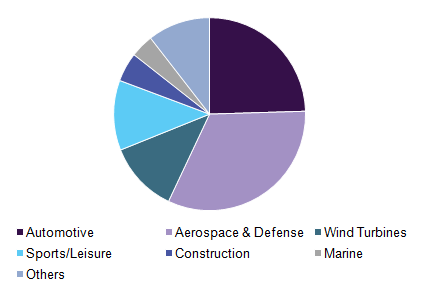 Carbon Fiber Reinforced Thermoplastic Composites Market Driven By Growing Demand For Lightweight Materials In Automobile Production Till 2025: Grand View Research, Inc. According to report published by Grand View Research, The global carbon fiber reinforced thermoplastic (CFRTP) composites market is projected to reach USD 7.74 billion by 2025.The demand for lightweight materials in automobile production, so as to reduce the overall fuel consumption is splurging the carbon thermoplastic market demand globally. The global carbon fiber reinforced thermoplastic (CFRTP) composites market is projected to reach USD 7.74 billion by 2025, as per a new report by Grand View Research, Inc. The demand for lightweight materials in automobile production, so as to reduce the overall fuel consumption is splurging the carbon thermoplastic market demand globally. Many developed countries such as the United States, Japan, Germany, etc. have a high concentration of automobile, aerospace and defense equipment manufacturing companies and so is the consumption of carbon thermoplastics composites in these regions. North America is anticipated to be the largest market for the product on account of the presence of major aircraft manufacturing giants like Boeing and many other top notch automobile manufacturers. Europe is expected to witness the highest growth over the forecast period. The presence of key automotive manufacturers such as BMW, Volkswagen, Mercedes, Fiat, etc. which emphasizing on building low-weight, fuel efficient, low emission, environment-friendly cars, has led to the increased consumption of CFRTP composites in the Europe. The market is growing and is composed of several large players. However, product cost is a major challenge faced by these companies. Key market participants have adopted strategies such as agreements, joint ventures, partnerships, and alliances so as to sustain the growing market competition. The petroleum pitch segment is projected to grow at a CAGR of 8.8% by volume during the forecast period. Key companies in this market include Toray Industries, Inc., SGL Group, Hexcel Corporation, Teijin Limited, Mitsubishi Rayon Co., Ltd., BASF SE, etc.